Custom shorty battery strap for the Xray XB4 2015. Comes with your name or nickname engraved on it. 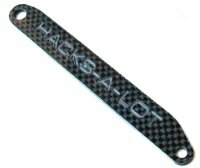 Made from 2.5mm gloss finish carbon fibre, this will impress all your race mates by having such a personalised touch added to your XB4! To order, just place an order and put a note in the Paypal payment as to what you would like engraved on your battery strap, and in what font (different fonts are pictured below). Or email me at thomas@bugleboyracing.com to let me know, or to check if your desired engraving is possible. Comes engraved with anything you want on it, as long as it's not too long, or rude.